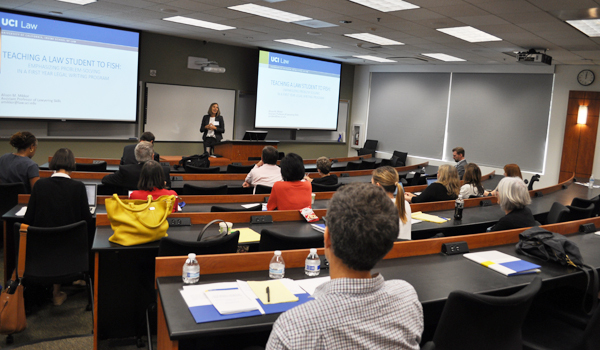 The Lawyering Skills program at University of California, Irvine School of Law hosted the Western Regional Legal Writing Conference on September 28th and 29th, 2018 in sunny Southern California. The theme of this year’s conference was Preparing Students for Modern Law Practice. UC Irvine is located in Irvine, California. The closest airport is John Wayne (SNA), which is only about 3 miles away. 401 East Peltason Drive consists of two large gray buildings on the corner of Campus and East Peltason (labeled “LAW” and “EDUCATION”). Head west toward MacArthur Blvd. Use the left 2 lanes to turn left onto MacArthur Blvd. Turn left onto Campus Dr. Turn right onto E Peltason Dr. If you need a parking pass, pull over at the parking kiosk on the right to purchase a parking permit. Turn right onto Pereira Dr. The Law School will be on the right. At the split, stay right on Pereira. To park in the lot adjacent to the building, make your first right into the parking lot. Turn right on Jamboree Rd. A general use pass allows parking in the Social Sciences Parking Structure. Reserved permits allow parking in any AR Reserved spot in Berkeley Place (the lot adjacent to the building). Parking on campus costs $10-$14 per day. Please visit the UCI Transportation & Distribution Services website for detailed information about parking locations and daily permit rates. 2018 UCI Preferred Rate: $169, single occupancy. For a complete list of hotels with UCI negotiated rates, please click here. To download the draft schedule, please click here (PDF).